If any door switches were the trouble, it would only be yours, as the driver. Maybe your steering column sensitivity is a clue. 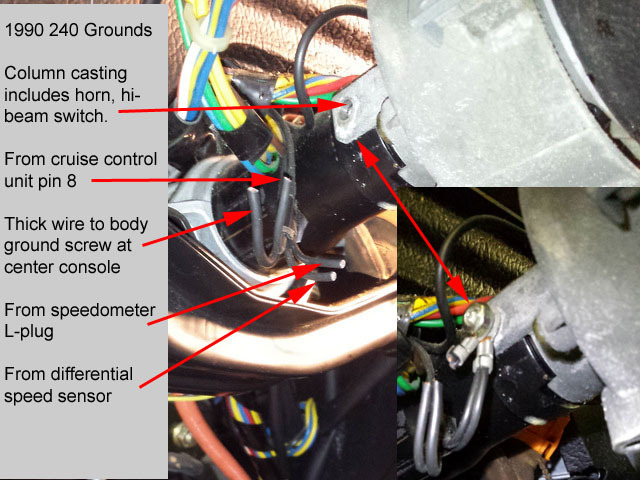 Check the common grounding screw. It gets its ground from a wire to the center console ground. Artificial intelligence is no match for natural stupidity. Users marked in green are currently online. ©Jarrod Stenberg 1997-2016. All material except where indicated. Brickboard.com is not affiliated with nor sponsored by AB Volvo, Volvo Car Corporation, Volvo Cars of North America, Inc. Brickboard.com is a Volvo owner/enthusiast site, similar to a club, and does not intend to pose as an official Volvo site. The official Volvo site can be found here. All participants agree to these terms.